Cootamundra-Gundagai Regional Council provides services and support to a community of approximately 11,500 people, including residents of our two main towns Cootamundra and Gundagai, as well as the villages of Adjungbilly, Coolac, Muttama, Nangus, Stockinbingal, Tumblong and Wallendbeen. Cootamundra-Gundagai Regional Council is a newly amalgamated Council formed by Proclamation of the NSW Government on 12 May 2016. 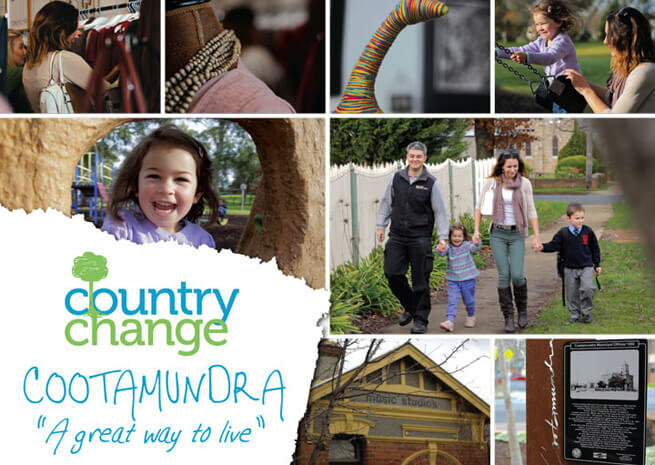 Cootamundra is a thriving, lively town of 5600 people set within a natural environment. It is a community with a heart based on its country values, its sense of belonging, its spirit and the warmth and friendliness of its people. Cootamundra is on the main railway line with regular daily services to both cities. Cootamundra is very well supplied with doctors and other professional services. We have excellent schools taking children through to year 12. Cootamundra has a large, strong economy built on well-established and diversified farming, industry and professional businesses and enterprises. Council and the town’s many professional and trades services are here to help you establish and support your business successfully. Reasonably priced residential blocks for around $75,000 in the Claron Estate to build your own home close to community services, retail outlets and schools. Or for under $300,000 you can purchase a comfortable older style home. Cootamundra is located on the main Sydney-Melbourne line on which twice daily services run. Tickets are available from Trainlink, Cootamundra Railway Station or through the Gundagai Visitor Information Centre via phone. Gundagai is a classic Australian country town situated in the Murrumbidgee River Valley between Sydney and Melbourne, in one of the most picturesque rural areas of the Riverina, in southern New South Wales (NSW). Gundagai is centrally located to all eastern capital cities and on the Hume Highway making it easy to get to. Gundagai residents enjoy the town’s strong community spirit and relaxed lifestyle, we enjoy distinct seasons and have the benefit of large amounts of public space. We have excellent parks, sporting facilities and an Olympic Pool. The town also has two supermarkets and a good variety of specialty shops and service businesses providing everything you need in day to day life. The Gundagai Neighbourhood Centre and library offer supported activities for both children and the elderly. We also have an aged care home and a recently built state of the art hospital, and a number of excellent schools. 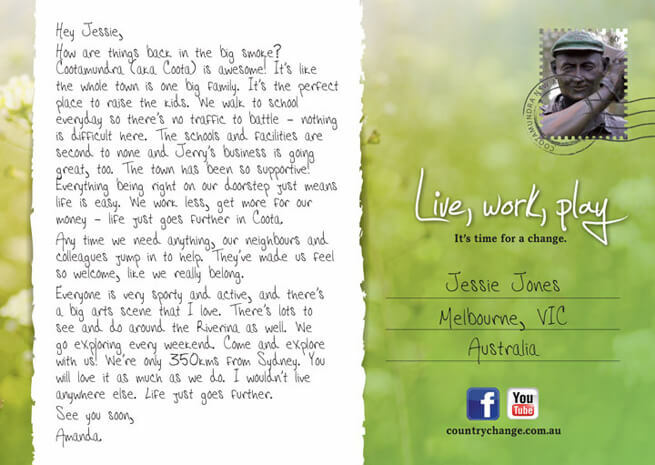 Why not join us and share in the quality of life that the country lifestyle can bring, for you and your family! For around $350,000-$450,000 newcomers can purchase a three or four bedroom new build or renovated period residence. Currently there is excellent development land available in the Council owned Bourke Estate, and a number of other privately owned subdivisions. Firefly Express provide coach services to Sydney, Melbourne and Adelaide. V-line also provides an economical combined coach and rail service to Canberra and Melbourne. A coach service to Cootamundra enables residents to connect with the TrainLink Rail Services Sydney to Melbourne. Wagga Wagga airport is a 45 minute drive away and offers excellent long term parking facilities for use during extended trips away. Cootamundra Hospital is a 33 bed level 3 hospital and provides acute and community health care services. Gundagai Multi-Purpose Centre is a newly developed hospital having been completed in 2012. Cootamundra offers employment opportunities from professional trades, medical, retail, technologies to small businesses and industries. Major employers in Gundagai include Gundagai Meat Processors, Lynch Engineering and the Cootamundra-Gundagai Regional Council. Opportunities also exist for employment in farming, retail and trade industries. Cootamundra Hospital is a 33 bed level 3 hospital and provides acute and community health care services. The hospital provides emergency, surgical, obstetric, paediatric and high dependency care. The Cootamundra Medical Centre has 6 doctors A range of qualified health professionals including child and family health, speech therapy, asthma and respiratory education, audiometry, community nursing, diabetes education, dietetics/nutrition service, drug and alcohol counselling, immunisation, women’s health, child and adolescent and adult mental health, dementia day care, aged care assessments, occupational therapy, day centre for the aged and palliative care centres. Cootamundra has 3 Primary schools, 2 High Schools (1 to year 12 and 1 to year 10), 1 Special needs school, a variety of early childcare and preschool options and a campus of the Riverina Institute of TAFE. The library also hosts a variety of training courses including regular University of the Third Age (U3A) meetings. Sport is played all year round with sport for all ages. Sporting opportunities include 3 Codes of Football, Cricket, Soccer, Squash, Tennis, Bowling and many more. If outdoor sports are not for you the Cootamundra Sports Stadium has just about any other sport you could ask for. We also have lots of Community groups to get involved in too. Anything from Antique cars to Arts and Craft and volunteering. The Arts Centre is the hub of creativity in Cootamundra and the surrounding district, providing a stimulating, creative environment for all ages. It offers courses, workshops, performances, seminars and activities across many of the arts including music, theatre, sculpture, painting, pottery and stained glass. New activities and courses are being added regularly as the centre grows. The Heritage Centre (former Railway Barracks Railway Complex) houses an eclectic display of historical items relevant to Cootamundra and district in a large main gallery (former dining room), kitchen and 14 smaller galleries. The town Visitor Centre is co-located here, which makes it the ideal first point of call. Unique to Cootamundra, the Captains Walk at Jubilee Park features 42 bronze sculptures of Australian Test Cricket Captains, along with Unaarrimim the leading Aboriginal player in the first Australian cricket team to tour England in 1868. Granny Scholz, the mid-wife who delivered “The greatest batsman the world has ever known” Sir Donald Bradman on 27 August 1908, operated a small private hospital in the front room of the building at 89 Adams Street. The birthplace has been restored by Council. Cricket memorabilia on Sir Don and local Cootamundra teams are on display. You have a choice of employment opportunities from professional (law, finance and teaching) trades, medical, retail, technologies (work at home) to small businesses and industries. Gundagai Multi-Purpose Centre is a newly developed hospital having been completed in 2012. The hospital is able to provide emergency medical care through the support of Visiting Medial Officers from Gundagai Medical Centre and also has a long term ward and an aged care facility on site (Uralba Hostel). The Centre also provides community health services, imaging and visiting specialist and allied health services. Gundagai Medical Centre offers a privately billed GP service and visiting specialist and allied health services. Patients not able to receive a specialist service locally or requiring surgery are generally referred to Sydney or Wagga Wagga. There are also a number of natural therapy options available locally. Gundagai has three primary schools, including a Catholic School. There is also a community preschool and public high school. Childcare is available through Gumnut Childcare Centre, and after school care through the Gundagai Neighborhood Centre. Charles Sturt University (CSU) is located in nearby Wagga Wagga (78 km) as are the TAFE NSW Riverina Institute campuses, as well as Rural Clinical Schools of both the University of New South Wales and the University of Notre Dame. Gundagai presents a variety of sport and leisure opportunities including water sports such as water skiing, canoeing, kayaking and freshwater fishing. Rugby League, soccer, hockey, and cricket competitions are run locally, with netball, little athletics and Rugby Union being played in Tumut (34km). In all the extra time that you will have in your day without the daily commute cycle the “bikeways” or take a nature walk along the banks of the Murrumbidgee. Take the kids to Yarri Park to play on the playground and use the free barbeques, beautifully maintained by the local Lion’s Club. Go fishing in the Murrumbidgee River or at nearby Blowering Dam or in the trout streams of the Kosciusko National Park. Or visit the nearby Selwyn snowfields. Locals have the opportunity to brush up on their game on the town’s excellent 18-hole golf course, or play a game of lawn bowls or squash on the excellent facilities provided by the Gundagai Services Club. A range of exercise class options are available including Yoga, Cross-fit and others. Gundagai Olympic Swimming Pool is open daily through the warmer months, and is an excellent facility for both laps and as a family activity, incorporating a swimming club. Also located at the pool complex is a Gymnasium. There is also a Scouts/Cubs, Pony Club and regular race meetings at the Gundagai Race Course. Gundagai Library facilitates local and family history groups and book clubs as well as a number of other adult and child learning opportunities. A Men’s Shed and Craft Group are in operation in town providing further opportunities to socialise and be creative. There are also many opportunities to get involved in the community through voluntary groups such as Gundagai Museum, Gundagai Lions Club, Gundagai Rural Fire Service, and Gundagai Bushcare Group. Gundagai holds a number of annual events including race days, rodeos and of course the Gundagai Show, to keep your social calendar full. Marvel at Rusconi’s Marble Masterpiece, a miniature cathedral painstakingly carved from marble by a local sculptor over 28 years on display at the Visitor Information Centre. Take the self-guided Audio Tour of the Old Gundagai Gaol. View Phar Lap’s saddle cloth and many other items of interest at the Gundagai Historical Museum. Gundagai is also an excellent place to start your own business, with low set up costs making this option accessible to many within the community. If you are interested in setting up a business and would like support please contact Council. Adjungbilly is a rural community 45 kilometres east of Gundagai. The area has a community hall and a small isolated primary school named the Bongongo Public School. Mass is held 5th Sunday of the month 10:00am alternating between St Patrick’s, Adjungbilly and Our Lady of the Rosary, Gobarralong. The village of Coolac is 20km from Gundagai, adjacent to the Hume Highway and has a General Store and Hotel. The village is home to around 200 people has a number of very attractive old stone and brick cottages. The Coolac Recreational Grounds & Coolac Memorial Hall have facilities including a public toilet, tennis courts, cricket nets and playing fields. Muttama is a rural community of 131 people in the central east part of the Riverina. It is situated by road, about 24 kilometres south from Cootamundra and 17 kilometres north from Coolac. The area has a community hall and tennis court. Nangus is a village of 205 people on the Wagga Wagga to Gundagai Road on the north side of the Murrumbidgee River. Nangus is approximately 24 kilometres due west of Gundagai and has a post office, Anglican church (services held 11am 2nd & 4th Sundays), general store, with an off-site liquor licence, public school, public hall, fire station, petrol station, tennis courts, and hockey fields. Stockinbingal is a historic village 22 kilometres North West of Cootamundra along Stockinbingal Road, and has a population of 200. The village enjoys a strong sense of community and has a primary school, post office/general store, hotel, bowling club, oval and park. There is town water. Tumblong village consists of collection of private residences on the road to Adelong, situated a short 16km from Gundagai. The popular and growing village has a pub, a hall and tennis courts. The population is 196 people. Wallendbeen is a village 21km north-east of Cootamundra, with a population of 260. Wallendbeen has a fine oval, hotel, service station, tennis courts, parks and a school, which is the main focal point of the community. Wallendbeen has town water.